Repsol Honda rider Casey Stoner took his sixth win of the season, finishing the Czech GP ahead of team mate Andrea Dovizioso and San Carlo Honda Gresini rider Marco Simoncelli, who managed his first podium finish of his MotoGP career. 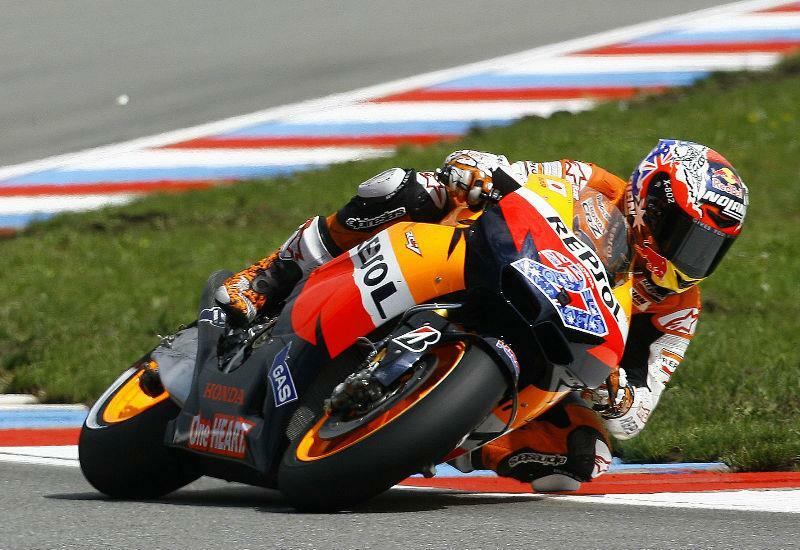 Dani Pedrosa (Repsol Honda), who had dominated practice and qualifying to start on pole, managed a strong start to lead, before Yamaha Factory rider Jorge Lorenzo relegated him to second on the second lap. Pedrosa then promptly crashed out of the race and Stoner stole the lead from Lorenzo, allowing him to create a gap at the front. Andrea Dovizioso then closed the gap on Lorenzo, before passing him to take second place, whilst Simoncelli also was able to pass the Spaniard and maintain third to take his first podium finish. Ben Spies closed the gap on his team mate, but was unable to challenge Lorenzo for fourth and finished the race in fifth place ahead of Ducati team mates Valentino Rossi and Nicky Hayden in sixth and seventh. Monster Yamaha Tech 3 rider Colin Edwards (Monster Yamaha Tech 3) finished in eighth, whilst his team mate Cal Crutchlow suffered a crash at the first corner, sliding in to the gravel in a shower of sparks. Hiroshi Aoyama (San Carlo Honda Gresini) and Héctor Barberá (Mapfre Aspar) completed the top ten. Karel Abraham (Cardion AB Motoracing) also crashed at Brno but was able to rejoin the race, later retiring with mechanical problems. Álvaro Bautista (Rizla Suzuki) crashed out, losing the front end whilst trying to challenge Rossi for sixth position.